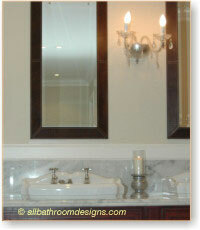 A beautiful antique bathroom vanity immediately draws the eye and creates a sense of style in any bathroom. Vintage bathrooms lend themselves ideally to using furniture from other parts of the home, so before you look at "new" antique bathroom vanities, let's have a look at some creative ways to recycle existing furniture. Almost any cabinet can be modified to house a sink: a dressing table, writing desk, sideboard or chest of drawers. Whether the sink is of the vessel type or sunken, the hole will be hidden by the base of the sink or the rim. Care must be taken to properly caulk the edges, for ease of maintenance and to prevent seepage of water into the seam, which may cause damage to the cabinetry. The proper sealant must also be applied to exposed wood. 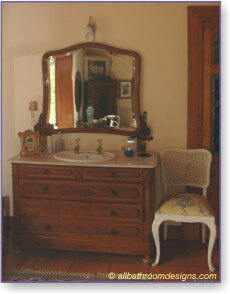 Have a look at our Antique Bathrooms page to see how beautifully this vanity fits in. Your choice of wood finish will determine to a large extent for which period style your antique bathroom vanity is most suitable. For example, Oregon Pine will match a country style whilst a rich Mahogany will be perfect for a Colonial bathroom. 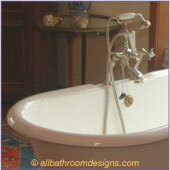 Take a look at the French Country bathroom for lovely ideas where items are re-invented to adjust to modern living. 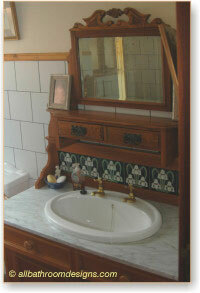 Old Art Nouveau style tiles can be used on the countertop or backsplash to create period charm. "Pique assiette" is a mosaic technique where found materials are used such as broken ceramics: tiles, plates, cups etc. This technique has been used for ages and it exemplifies the art of recycling combined with a touch of humor and style - ideal for your antique bathroom vanity. Be sure to seal all grout lines on your countertops to prevent staining. You can also replace the wooden top of an old cabinet with a beautifully finished marble or stone slab - so typical of Victorian bathrooms. This gives you the opportunity to have either an above-counter or under-mount sink. 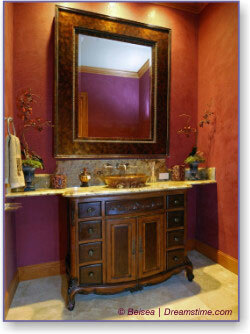 Marble or stone should be sealed to prevent staining - get advice from the supplier. 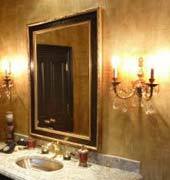 Antique brass bathroom faucets can still be found relatively easily and are the perfect complement for your antique bathroom vanity. Although restored, they may show pitting and discoloring which adds to their character. Even antique lighting fixtures can provide adequate lighting for your needs or you can use additional modern lighting such as ceiling mounted down lighters. Genuine vintage pieces may be rewired and fitted with modern light bulbs and dimmer switches. Of course there is no rule that says you should carry the antique theme throughout every element. 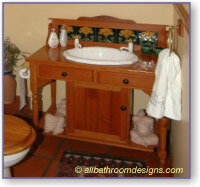 An antique bathroom vanity can be accentuated by the use of an ultramodern faucet or vessel sink. It serves as stark contrast and adds an element of fun. 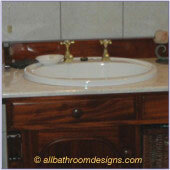 Antique bathroom vanities are typically curvaceous with a lot of attention to detail. Using above-counter sinks is reminiscent of vintage wash basins that sat on bureaus. There are some companies who salvage and restore genuine antique pieces and may do it to your specifications. They can also re-silver mirrors if need be. Alternatively you can look for reproduction pieces that will give you the look you want, without (perhaps) the higher price of a genuine antique. Have a look around your or grandma's home or pop into a couple of auctions or second hand stores. 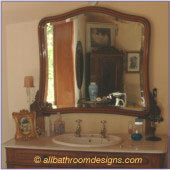 You may just find a hidden treasure and the perfect piece to turn into your antique bathroom vanity.